Last Monday I posted a tutorial for scanning dragonflies using a flatbed scanner that is based on a technique created by Forrest Mitchell and James Lasswell of Texas A&M University. The technique works fabulously for dragonflies and allows you to document your odonates in life-like color before you either add them to your collection (and watch them fade to a dull brown over a few weeks) or release them back into the area where you collected them. Easy peasy and the images look wonderful! I scan my dragonflies live because the colors change very quickly after they die, but I scan nearly everything else after it’s spent some time in my kill jar. 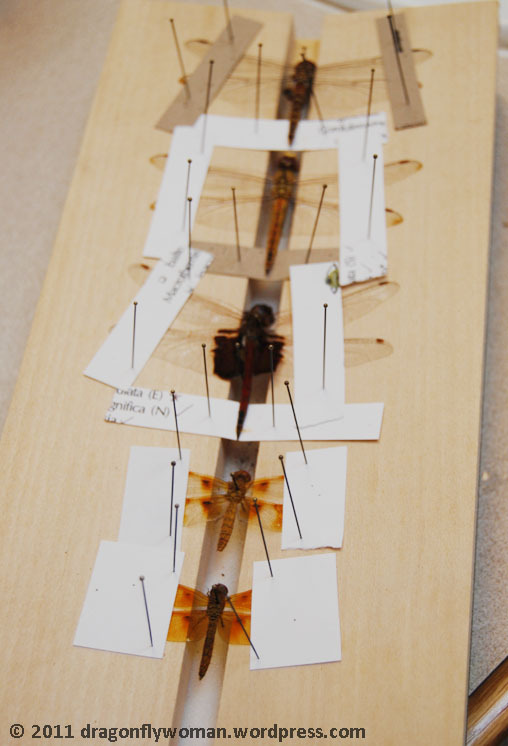 I personally find dead insects easier to work with and I’m putting everything I scan into my collection anyway, but you can certainly scan your insects live by following the dragonfly technique. Just remember that the insects need to be well chilled and you need to work quickly when you work with live insects to avoid their reviving before you’ve finished scanning! Once you get the scanner set up and you have your specimens (live or dead), you’re ready to scan. If you’re working with dead specimens, it’s a good idea to give them a good dusting with the can of air, especially if you’ve ever put any butterflies or moths into your kill jar. The scales get on everything and will show in your images, so dust your specimens well to ensure clean images. 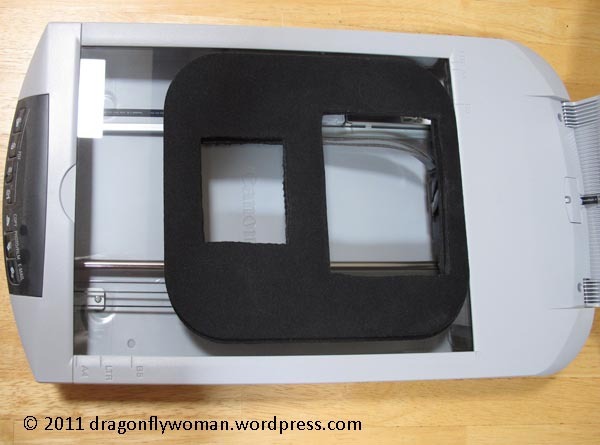 Place the insect on the scanner glass within the hole in the mousepad, position the body parts as you like, and carefully place the lid down, just as described for the dragonflies. Then make the scan! 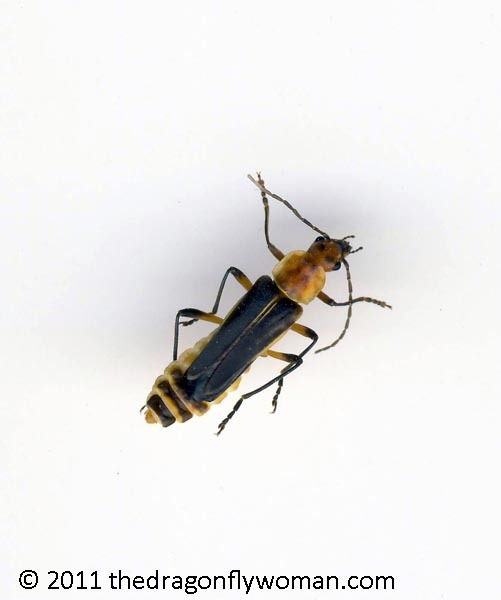 If you’re using live insects, remember that you need to balance your desired image quality with a quick scanning time to avoid reviving your insects during scanning. You’ll need to play around with your scanner to figure out what works best for you. If you’re working with dead insects, you can boost the resolution as high as you wish because your insect won’t go anywhere while you’re scanning. Once you have the image, you’ll probably want to touch it up using Photoshop or some other image manipulation software. As I mentioned last week, I adjust the levels so that the background is pretty close to white and crop out extra space and any bits of mousepad that are showing, but otherwise leave most things alone. The specimen arrived fairly tattered, but I scanned it anyway. I love the colors! I did not dust this beetle, so you can still see butterfly scales on its back. I love the detail on this bug! It’s got amazing hind legs and a stylish Charlie Brown-style stripe across its back. Gorgeous! Plus, it is a fairly thick bug, but nearly all of it is in focus. The depth of field on scanners is surprisingly high! I usually scan the top and the bottom of my insects so I have good images of both sides when I’m done. This is obviously the view from the bottom. 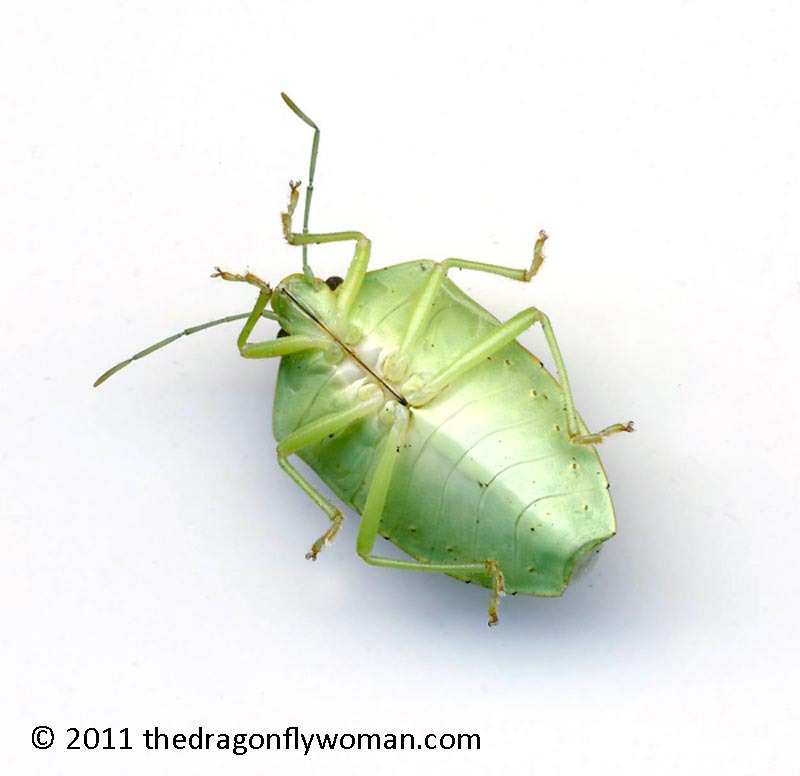 Apart from the glorious green color of this stink bug, I love that you can see the spiracles along the sides of the abdomen. As a scientist who is very interested in insect respiration, I was thrilled that they showed up so well in this image! 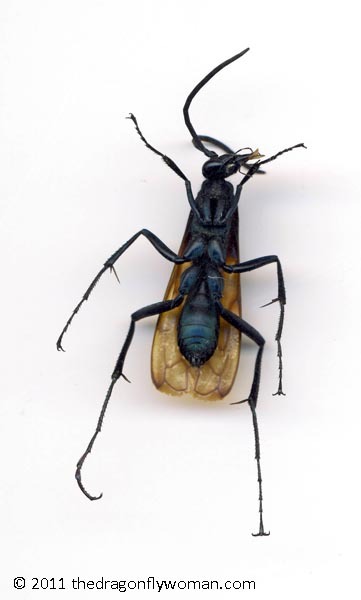 Overall, I think the quality of insect images that you can make using a scanner is quite good. The depth of field is sufficient to scan some reasonably large insects with great clarity and the white background gives the image the same sort of look you get using a camera with a macro lens and a white box. I have both, but I can honestly say that scanning is faster and easier than hauling out all of my equipment to take a white box photo and the image quality is nearly as good. I’d like to finish up here by pointing out that one of my favorite insect artists, Joseph Scheer, has created some truly spectacular images of moths using a super high-resolution scanner. If you haven’t ever seen his traveling exhibit (you can view the program for his 2006 exhibit at the University of Arizona here), I highly recommend his book Night Visions. It’s stunning! Also, Alex Wild recently posted a scan of a cicada wing as part of his Thrifty Thursday series on Myrmecos.net. I think it’s very beautiful, so I hope you’ll check it out! And, if any of you have images of insects that you’ve scanned available online, please feel free to leave a link below. I’d love to see what other people have come up with! I have incredibly bad luck when it comes to tires. 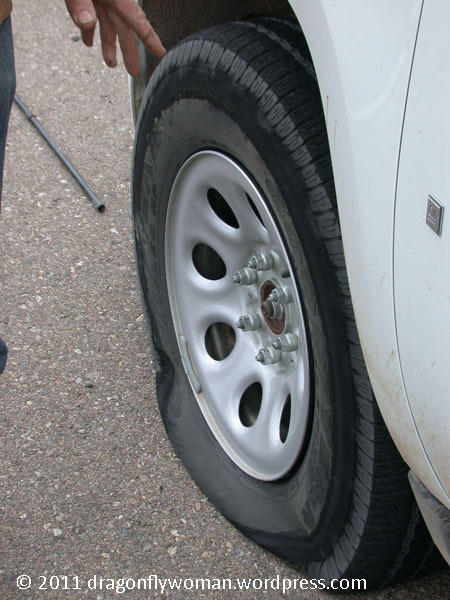 Doesn’t matter if it’s my own car or a rental – if there’s anything even remotely sharp on the road, I’m going to get a flat. I finally got through one entire field trip without a flat last spring and I was so happy I almost cried. Seriously, I am cursed. Bad driving weather, Arizona style! …and after an hour or so of futzing with the tires, we were on our way back home. Worst car troubles ever on that trip! My sister the park ranger has lived in awesome places over the past decade. She lives in the National Parks where she works, so I unfortunately can’t collect around her house. 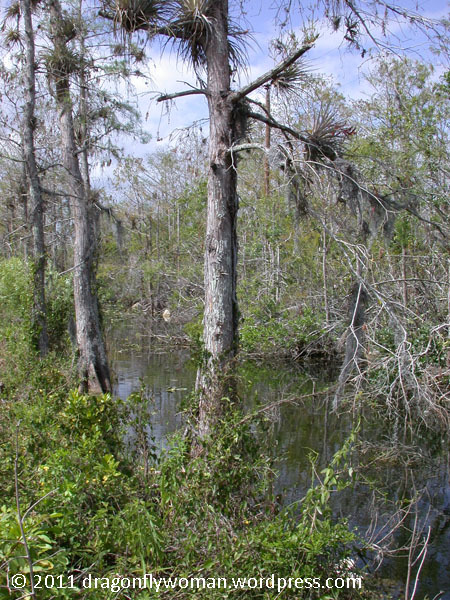 When I visited her in the Everglades, we decided to go to Big Cypress one day and do some bug collecting outside of the parks. 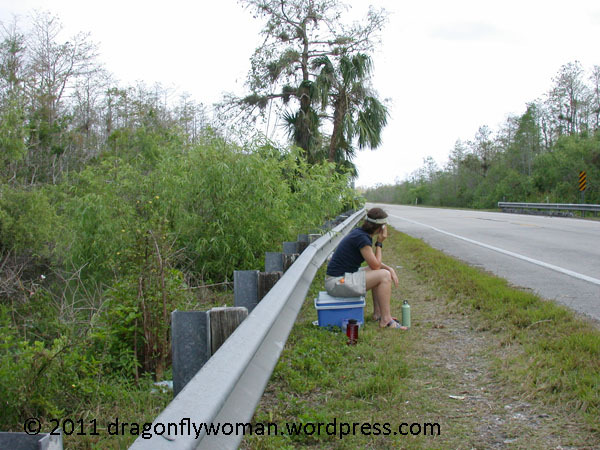 We started down the Tamiami Trail and were about 15 miles from nowhere when we got a flat. My sister and I have gotten so many flats together we’re skilled tire changers, so we hauled out the jack and lug wrench. We quickly learned that the jack was 4 inches too short, fully extended! Apart from dismantling the guard rail (which we did consider), there wasn’t anything we could prop the jack up on to make it work. This flat was on another class field trip. We were headed up to the White Mountains to collect aquatic insects and stopped off at the San Pedro river on the way. We traveled down this impeccably maintained dirt road, then pulled off near the river. As we ate our lunch, one student noticed the tire hissing. 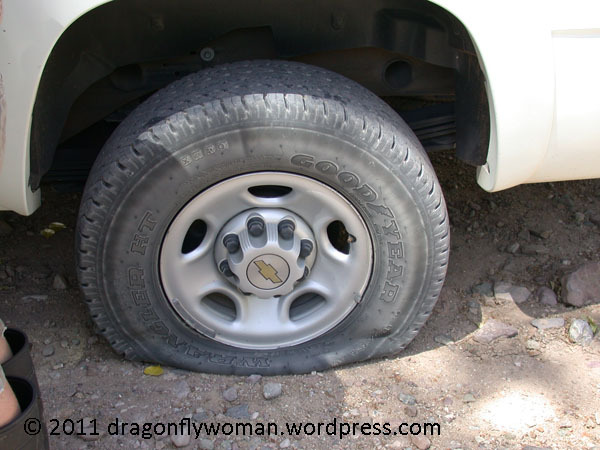 By the time we’d eaten, the tire was completely flat. Last time I taught the aquatic entomology lab, we almost made it through the whole 3 day collecting tour of southern Arizona without a flat. On the way to the last collecting site of the trip (and 30 miles from home) we got our traditional flat. Much to the amusement of the females of the group, the guys got out and started working on the tire, but everyone had a different opinion about how to do it. Ever watch a bunch of guys trying to make a campfire as a group? It was like that! The tire was eventually changed and then we turned around and headed home. Hopefully this will be my last field trip flat ever! Don’t forget to enter my contest! If you haven’t done so already, you can enter here. Tomorrow’s the last day to enter. I believe that all entomologists have some sort of horror story from time spent in the field. I’ve already shared my centipede story and my giant water bug attack story, but I have oh so many more! Today I’m going to share a few scary stories from my deep treasure trove of memories. I live in Southern Arizona. If you know anything about this area, you know that it’s becoming increasingly dangerous to wander around in the desert. I don’t worry about the illegals crossing the desert. Give them some water and they will be so grateful they’ll name children after you! But the drug dealers… That’s an entirely different matter. One of my field sites is in a prime drug running area. The area is absolutely crawling with Border Patrol agents, but it doesn’t make much of a difference. Every time I go out to that field site, I hope I don’t see anyone. I never go alone. I carry a gun with me. It’s scary being out there at the best of times, but one time there was this ominous black truck parked along the little dirt road you take to get to the pond. A really nice truck. The kind of truck you wouldn’t ever see on a tiny little overgrown ranch road for legitimate reasons. There was a guy sitting in it. My companion and I drove past and collected water bug eggs anyway (I would have turned around if it were up to me, but I wasn’t driving), and we were totally on edge the entire time. We stopped and listened carefully every time we heard a car (extra stressful considering there is a busy dirt road obscured by a small hill just on the other side of the pond!) and prepared to shoot our way out if necessary. It was incredibly stressful. It’s hard to convey the fear I felt! The experience made me so much more cautious than I’d ever been in the past though, so I suppose some good came out of it. We talked to the people in the visitor’s center when we arrived and they warned us that there had been a bear in the area that day, hanging out around the ponds we were intending to collect. We promised we’d keep an eye out for it and headed into the canyon with a volunteer as our guide. As we walked up the hill, a couple came down saying, “There’s a bear! There’s a bear!” They pointed up the hill and practically ran toward the visitor’s center. A minute later, a family told us that they’d just seen a bear and pointed up the hill as they rushed past us on their way out of the canyon. When we get to the pond and prepared to collect, we fully expected the bear to wander in at any moment. Guess who had to take her eyes off the surroundings and get into the pond to collect? Me! I don’t think I’ve ever been so scared collecting in my life! I kept looking up to make sure the bear wasn’t coming, which made collecting very difficult. And then I didn’t catch any of the bugs we wanted! Nor did I ever see the bear! Total bust. The canyon was gorgeous though, and the threat of the bear made it so much more zesty. As a result, I now remember that adventure rather fondly! Ah, the joys of bug collecting in Arizona! I’m sure some of you have some great stories like these. I’d love to hear them if you want to share them in the comments! I’m giving away another aquatic insect mug! If you haven’t done so already, you can enter here. So, yeah. My family generally thought I’d lost it when I told them I was packing up and moving to Arizona for grad school. Never mind that a good number of them had been to Arizona several times themselves and know that there’s a decent amount of water here. I myself remember trips to the local spring-fed oasis and several streams in the mountains when I lived here as a young child and came back to visit my grandparents. I knew there was water here and I wasn’t going to let any of those naysayers get me down. I was going to study aquatic insects in the desert, gosh darn it! Since I started grad school, I’ve had the opportunity to visit many, many aquatic habitats in Arizona. 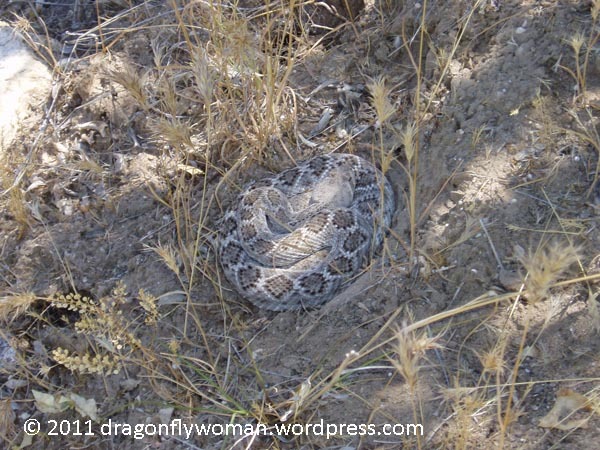 Some of them, like the area where I do my summer field work, are appallingly disgusting. Others are gorgeous and pristine. 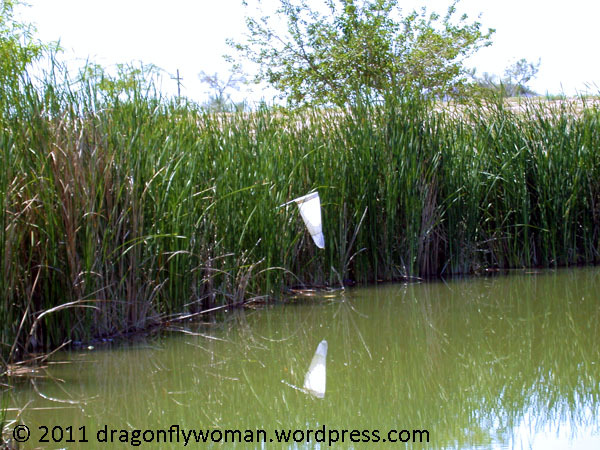 Today I’m going to share my top 5 places to collect aquatic insects in Arizona. Some are favorite locations due to the insects they contain and others because the area itself is so amazing, but they’re all special to me. Arivaipa Creek. I just wrote about this creek, so I won’t say much more here. This creek is one of my favorites because getting to go there is something special in and of itself. The area is also incredibly beautiful and is home to some fantastic insects. Really love this creek! Check out the post linked above if you would like more information about the area or my recent trip there. Madera Canyon. I’ve been going to this canyon stream all my life. In fact, some of the very first photos I ever took were at Madera! 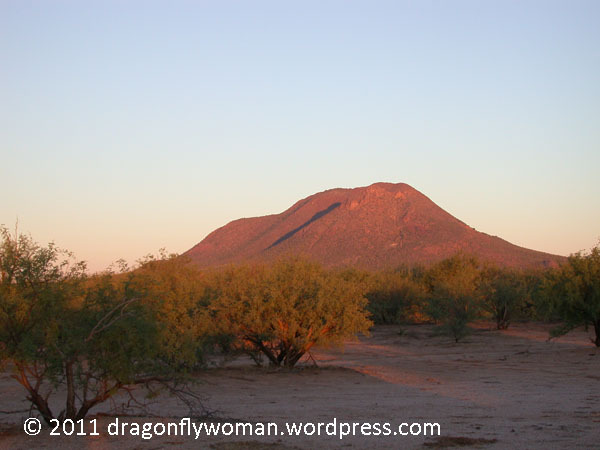 Madera Canyon is in the Santa Rita Mountains south of Tucson and east of Green Valley, AZ. The creek flows mostly over the big rocks you see in the photo, and for the most part it flows year round. (Yes, I count that little 4 inch wide trickle you sometimes get in the summer as “flow!”). Madera is very pretty, but I also love the insects I find there: lots of caddisflies, sunburst beetles, two types of whirligig beetles, water scorpions, fly larvae, lots of other beetles and bugs. 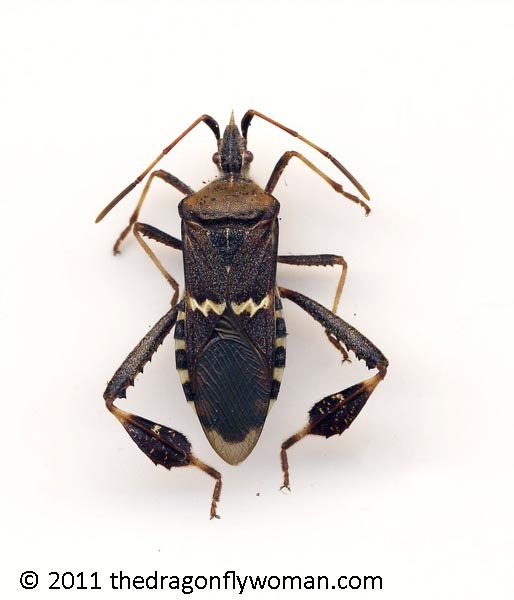 The creek is even home to a unique beetle (an riffle beetle) that is thought to be found only in this one creek! The downside is the canyon is VERY popular for birding (there are some rarely spotted birds there), so there are usually a lot of people there. Reynolds Creek. I recently wrote about aquatic insects with suction cups and described my joy at discovering net-winged midge larvae for the first time. I found them in this creek. Reynolds Creek is in the mountains south of Young, AZ and north of Globe. It’s way out in the middle of nowhere, so it’s usually visited only by campers and hikers. The pine forest surrounding the creek is stunning and the water is cold and clear, so it is an entirely pleasant place to spend a few hours or the night. There are all kinds of interesting things in this creek too. However, the sheer elation I experience every time I find the blepharacerid fly larvae here would be enough to keep me coming back, even if there was nothing else to find. Salt River (a few miles upstream of Roosevelt Lake). The Salt River is one of the few big, perennial rivers in Arizona. As such, it is heavily utilized by people who enjoy water sports (tubing and rafting are both very popular – the location in the photo is a raft pullout point) and is therefore far from pristine. However, this is still one of my favorite places to collect. The water flows swiftly and powerfully, and it gets quite deep in places. This means that there are some excellent flow-adapted insects in the river. My favorite: the gigantic hellgrammites this river produces! They’re close to 3 inches long and they’re fierce. In fact, I tell my aquatic entomology students to put them into their own bags when they collect them from this river. The hellgrammites will eat everything else in the bag before they expire, leaving you with a single bloated hellgrammite floating amongst an assortment of insect legs. This river is also one of the only places I’ve found sisyrid larvae, but I’ll discuss them further in a future post. Three Forks. 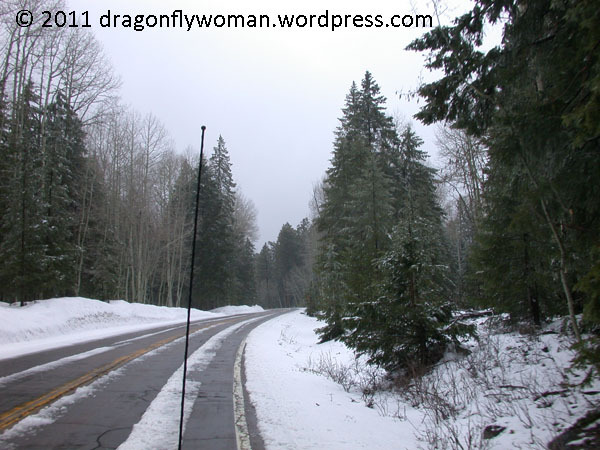 Three Forks is located in the White Mountains east of Alpine, AZ at the confluence of the East Fork of the Black River, Coyote Creek, and Boneyard Creek. The photo doesn’t do this location justice at all as the bright sun at the high elevation consistently causes me problems when photographing this area. Three Forks is a high elevation, cold, fast flowing stream, so it’s got some great insects in it. 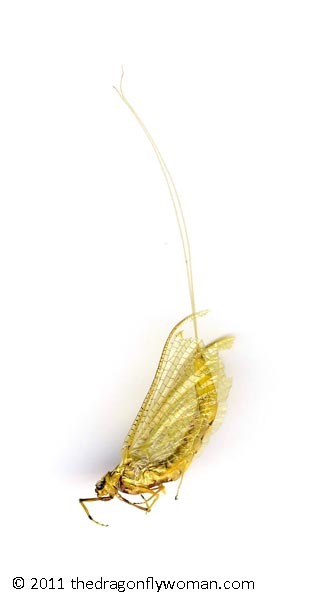 My favorites are the water pennies, the flat mayflies (heptageniids), and the aquatic moth larvae. You can only collect in specific areas of Three Forks though. It has become a conservation site for an endangered snail that is being decimated by invasive crayfish, so you now need special permission to access the protected area. 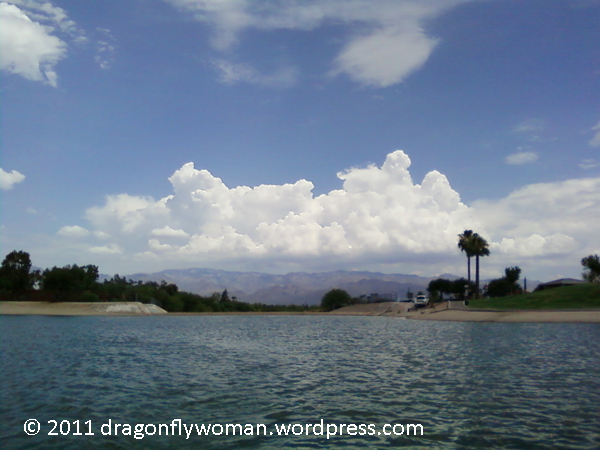 So those are my top 5 areas in Arizona for collecting aquatic insects! If you ever visit Arizona, any of these places are well worth visiting even if you have no interest in collecting. I think they are some of the most beautiful areas of Arizona. This year, one of my good friends and I decided that we were going to avoid all of the Black Friday nonsense in our city by going on an insect collecting trip. We were originally planning to go to Sycamore Canyon, an area we’ve both been to many times near Arizona’s border with Mexico. However, my friend is a fish scientist (ichthyologist for those of you don’t know) and happens to have access to a protected stream where I’ve never been able to collect. She was granted permission for us to collect from the stream in exchange for our sharing our findings with the land managers. So, we packed up my tiny SUV bright and early on Black Friday and drove 3 hours to the eastern end of Arivaipa Creek. Arivaipa is this wonderfully magical place that people have told me about since I arrived in Arizona. I’m always told stories about it in hushed tones like the place is sacred. Naturally, I’ve been dying to go. And Arivaipa really is a special place. For one, it has flowing water year round, uncommon for small streams in southern Arizona these days. For another, the creek is relatively clean with minimal runoff from roads and no sewage effluent. There may be some contamination by heavy metals from nearby mines, but the creek is largely unimpaired. It is also home to several native fish species, an increasingly rare quality in Arizona. Because is a sort of last-of-it’s-kind type of place, access to the canyon and the creek is restricted by the Bureau of Land Management. You can only hike in the Canyon with a permit and you have to cross Nature Conservancy land to get there, so you have to have double permission to enter. Only 50 people are allowed in the Canyon each day, so getting to go there is a real treat. 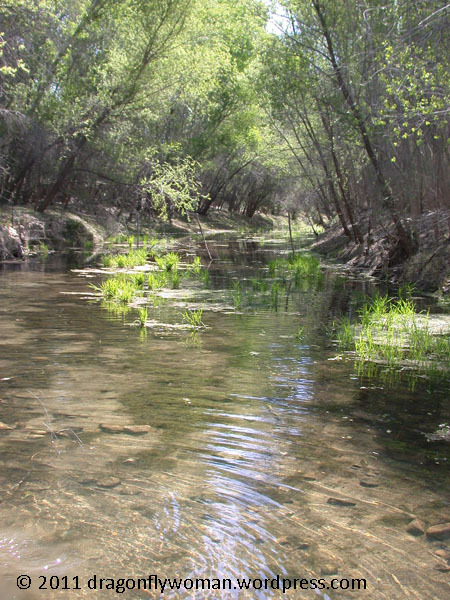 And getting permission to collect aquatic insects from a relatively pristine Sonoran Desert stream there is even better! We couldn’t have asked for a better day! It was supposed to be very cold in Tucson (it was supposed to get down to 26 degrees that night, which is positively frigid by Tucson standards), so we were a little worried it was going to be uncomfortably cool and we prepared for the worst. We lucked out and stepped out of the car to a bright, perfectly warm, gorgeous day! We both strapped on some impeccably clean waders and hauled a bunch of gear to the stream. we were pleasantly surprised the water wasn’t as cold as we’d expected. (Granted, I was still happy I was wearing my wool socks under my waders!) We each strapped on some gear, grabbed our strainers (best aquatic insect nets ever! ), and waded into the stream. We spent the next 4 hours wandering around in the stream hunched over, peering into the water and dipping our strainers into the creek in an attempt to collect as many different insects as we could. We were surveying the stream for the land managers after all! Due to the perfectly warm weather, there were clouds of adult mayflies swarming over the stream and I managed to catch a few of them with my strainer. We pulled several things out of the water that I’d expected to find in in Arivaipa Creek, things I knew other people had collected there. We didn’t get any specimens of other things that I was surprised were absent. My friend and I both had to be back in the early evening, so we couldn’t hike too far downstream. Thus, we missed out on some of the insects that are typically only found in Arivaipa Canyon, a 10 mile stretch of stream flowing between high, steep rock cliffs, or further downstream. That’s where all the hellgrammites are. Sadly we didn’t find a single specimen in the section of the stream where we were collecting. We did collect some exciting things though! We were feeling quite pleased with our day by the time we headed back home. Great day! Vials of insects collected from Arivaipa. The following week, we sorted through all of our bugs, removed them from the debris (we “picked” them), separated the insects into groups according to genus, and identified them to the genus level. In all, I collected 23 genera, including water bugs, water scorpions, several caddisflies, lots of beetles (including crawling water beetles – family Haliplidae – my favorite aquatic beetles), and some damselflies. The most exciting find of the day for me was collecting two different genera of dixid flies in one stream, something I’ve never experienced before. My friend also caught a beetle I’ve never caught on any of my many Arizona collecting trips, a marsh beetle (family Scirtidae). Overall I think we collected about 30 different insect species. That’s pretty good considering we only sampled a very tiny section of the stream during late fall/early winter!